Three hours before good was to take on its knavish, crimson-sheathed ghost of the past, several hundred faithful gathered for Mass, perhaps sneaking in one last prayer, one final rosary. After all, this was no ordinary fall Saturday in Baton Rouge. Nick Saban, also referred to under a number of monikers in the Capital City, most unprintable, was in town. This was Alabama-LSU, the game of the year for Tiger fans, especially since it was pitting the top-ranked Crimson Tide, also considered Public Enemy No. 1 since Saban ditched LSU more than a decade ago and two years later decided to play house in Tuscaloosa, against the Tigers, who were ranked third in the country at the time with dreams of a national championship dancing in their head much like a child’s own dreams on Christmas Eve night. “It’s Alabama, (we say) a little extra prayer,” said Houston resident Michael Mengis, a 1979 graduate of Catholic High School in Baton Rouge. 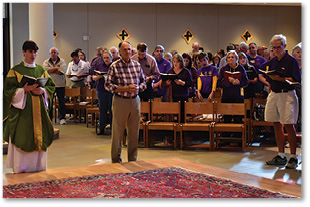 Mengis and more than 500 faithful, mostly garbed in purple and gold, gathered at Christ the King Church and Catholic Center on the LSU campus to attend the Saturday afternoon Mass, which is only celebrated during the fall when LSU is playing a home game, and always three hours before kickoff. Pastor Father Andrew Merrick said the Mass is an opportunity for fans to pray to receive the Eucharist before the game. He noted the normally well-attended Mass drew even a larger congregation on this day, as empty seats were about as sparse as the color red. Shortly before Mass, L.J. LeBlanc of Breaux Bridge said he had already prayed two rosaries that day, including one while walking across the campus. What about one more, especially since this was LSU-Alabama, the return of the prodigal son? “Why not?” LeBlanc said with a chuckle. 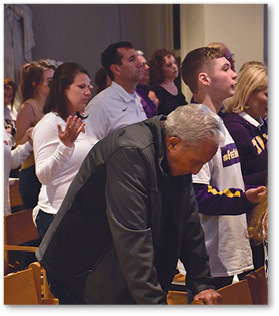 ESPN GameDay host Lee Corso bows his head during the praying of the Our Father. Corso said he tries to attend Mass on Saturday at the campus where GameDay is broadcasting since Sunday is a travel day. For Mengis, Leblanc and many others, however, attending the pregame Mass is more about tradition than rallying against a specific opponent. LeBlanc, a season ticket holder for the past 37 years, said he and his wife have been attending the Mass for the past 10 years, regardless who was lining up on the opposing sidelines. “We come early, say a rosary and read our prayer books,” he said. “The Blessed Mother said to pray the rosary, so we pray the rosary. Even ESPN GameDay host Lee Corso was in the act. Corso, who is Catholic, said he always attends a pregame Mass at the church on whatever campus GameDay is visiting because Sunday is a travel day. “(Christ the King) is terrific; it’s a great place,” said Corso, perhaps rubbing a bit of salve on the wound he may have opened only hours earlier when he donned the head of a red elephant when predicting who would emerge from Death Valley victorious. As the Mass ended, Father Merrick offered some final words of encouragement, noting that “thinking of the animal kingdom” the “Tigers are at the top of the list,” ranking well above elephants. Unfortunately for LSU fans, an elephant’s tusk speared the heart of the Tigers.